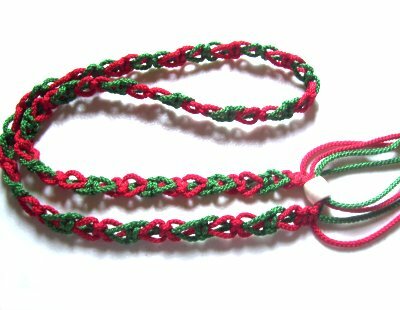 Description: The Switch Belt features the Square Knot, the most frequently used decorative knot in Macrame. 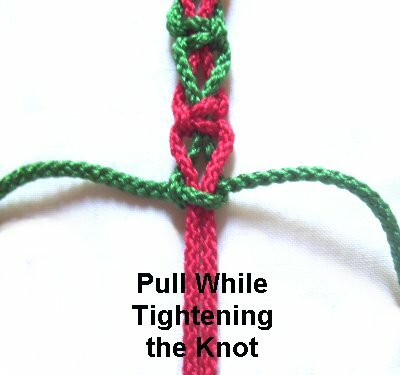 This is a great beginner's project, where you will learn to tie a unique variation called the Switch Knot. There is a simple Bead Clasp in this Macrame belt, but if you prefer something else, you will have 8 ends to work with. One unique feature of this belt design is that the knots face different directions when you switch colors. So you need to practice tying both right and left Square knots. The color change occurs when you swap the fillers and working cords. Important: The knots are tied with the working cords. The fillers run through the knot. In the example, Color A is red and Color B is green. Determine the size of the Switch Belt by measuring just above your hips with a tape measure. Prepare the ends with tape, glue, or Overhand knots. When you make the Switch Belt, there will be changes in the direction of the Square Knots (SK). 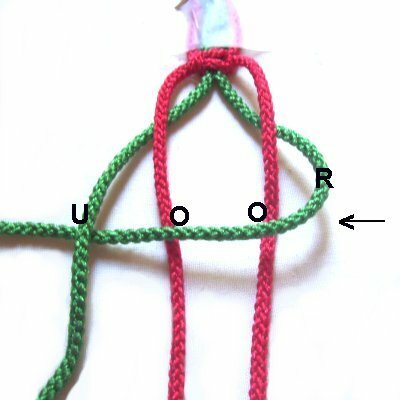 You use the HEAD of the knot to determine the position, as in the photo above. 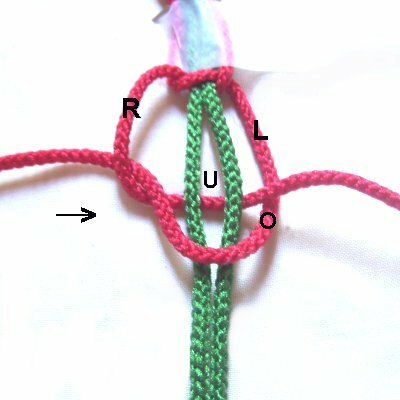 The rule to follow is that the head will face the same direction as the first cord moved when constructing the knot. 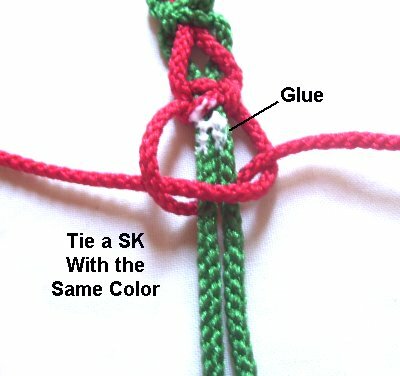 In steps 1 - 4, you will tie a Left SK with color A. Place a piece of tape across the cords at the center, to mark the place where the first knot should rest when it's tightened. 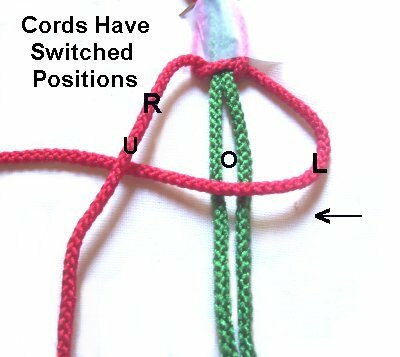 Mentally label the color A cords, which are used to tie the first knot at the center of the Switch Belt (working cords). The Color B cords are the fillers. 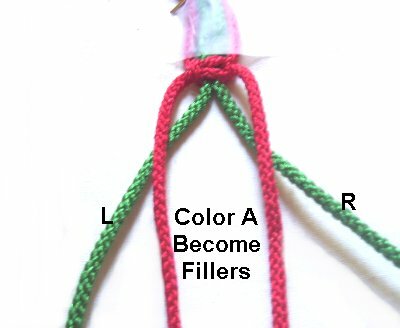 << Move the left working cord to the right, passing over the fillers and under the right cord. Pull on both working cords while holding the fillers firmly on the board. This completes the first half of the Square knot, which should rest against the tape at the center. The working cords have changed positions. So the left cord is now on the right, and the right one is on the left. << Move the left working cord over the fillers and under the other working cord, heading left. Important: Pull the filler cords downward, as you tighten each half of the Square Knots. This will help keep the areas between the knots straight. Now you will swap cords and change the direction of the SK. 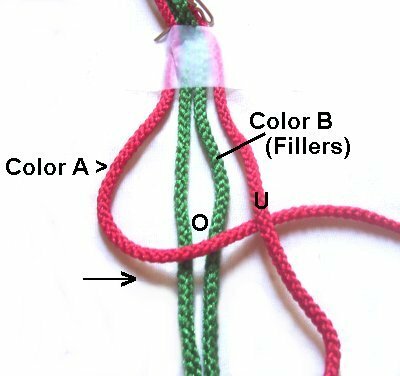 For the first half of the Switch Belt (steps 1 - 4), when you use Color A, you should always tie LEFT Square Knots. When you use Color B, you tie RIGHT Square Knots. Step 2: Position the color A cords so they rest between the color B cords. Color A will now become the FILLERS for the next knot. Mentally label color B (working cords) left and right. << Move the right working cord over both fillers, and under the left working cord. 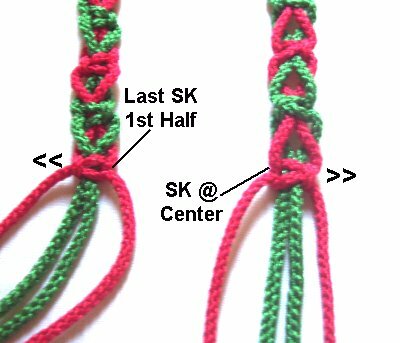 When you tighten the first half of this Square knot, make sure there is at least 1-inch of space between it and the SK above it (see left image below). The working cords have now switched places. So the left cord is now on the right, and the right one is on the left. < Bring the right working cord to the left, over the fillers and under the other working cord. Step 4: Repeat steps 1 - 3 several more times, until the Switch Belt is 1/2 the size you wish to make. So for a 28-inch belt, stop at 14 inches. Remember to switch cords each time, so the colors change. Also remember to change the direction of the Square Knots, and tighten them so they are 1-inch apart. Step 5: Turn the Switch Belt around, and return to the knot at the center. Notice that the SK is now facing the opposite direction. For the second half of the belt, right SK are tied with the color A working cords. Left SK are tied with the color B working cords. 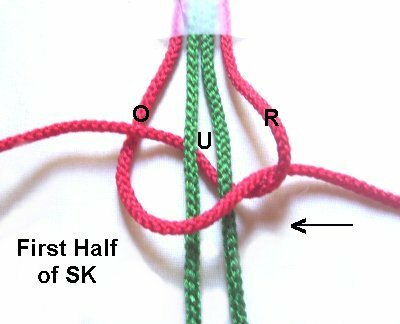 Step 6: Switch back and forth between the two colors, tying left and right SK, until the second half is the same size as the first half. Measure from the center, and be as accurate as possible. Add extra knots to both halves of the Switch Belt if you feel you need them. Step 7: Tie one extra Square Knot at each end, using the same working cords as the last knot tied. In this image, color A was used last, so this extra SK is color A, too. As you tighten the first half, add glue to the fillers, and then tighten the knot firmly so it's on the glue. Step 8: After the glue is dry, trim the cords so they are even. Arrange the belt in a circle, making sure it's not twisted and the front surface is face up. 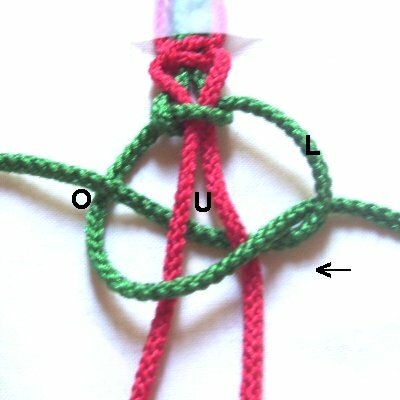 The last knots tied should face each other, with the ends spread apart somehwat, as shown in the image below. 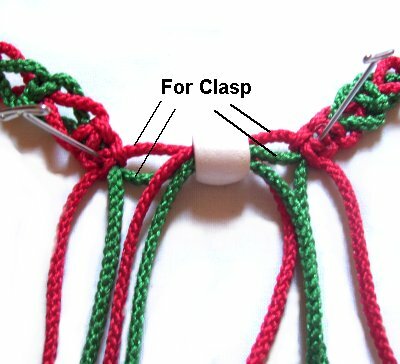 The two cords at the TOP, on each side, are used to make the bead clasp. The other two are not used, and will dangle freely. You can change this arrangement, and try to get all 8 cords through a bead instead of 4. 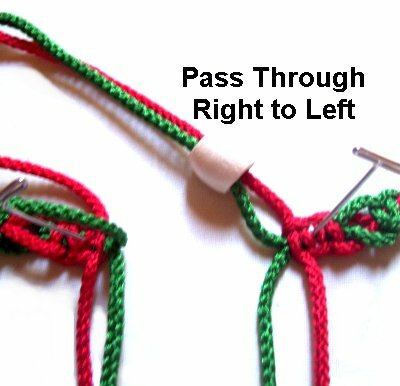 Bead Clasp: Pass the two cords from the right end of the Switch Belt through the bead from right to left. 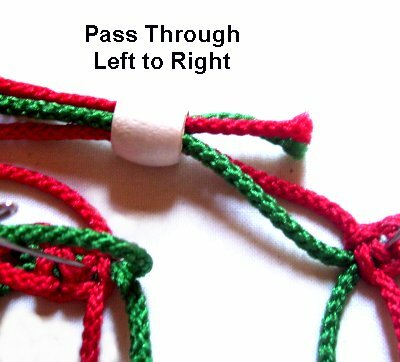 Pass the two cords from the left end through the bead heading left to right. Step 9: Trim the cords again, to whatever length you want the fringe. 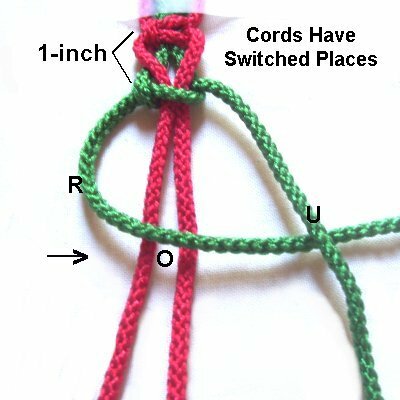 Tie tight Overhand or Barrel knots at the tips of each cord. 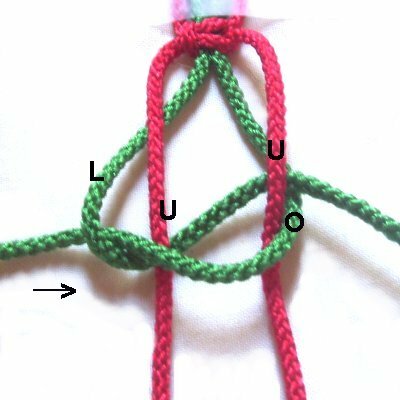 Other finishing knots can be used, if you want to make changes. Apply glue as you tighten the knots (so it's inside), and allow it to dry before cutting off the excess material. Have any comments about the Switch Belt? Contact Me.